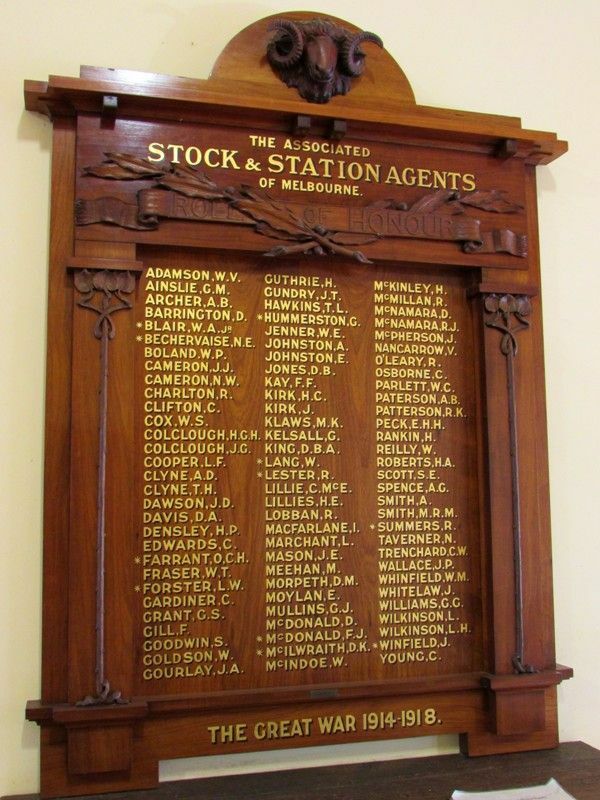 The Associated Stock & Station Agents of Melbourne Honour Roll commemorates those who served in World War One. 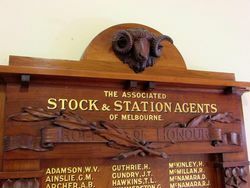 The honour roll was formerly at the Newmarket Saleyards. Sharp on the stroke of 3pm. last Monday, eighty members, representatives, and employees of the twenty eight firms composing the Associated Stock and Station Agents of Melbourne; gathered in the Board Room, Oxford Chambers to attend the function of unveiling the Honour Board presented by the Association as a tribute to the men who had gone to the front and all of whom were at the time of enlisting either employed in the offices or in the general business of the several firms constituting the Association. The Hon. Donald Mackinnon, Director General of Recruiting, performed the unveiling ceremony. A second Honour Board—an exact replica — will be hung at the Association offices at Newmarket and Mr. Mackinnon has consented to unveil it on the afternoon of Wednesday, the 11th of July. The Board is decidedly handsome of presentation, and is, composed of fine figured Australian blackwood. It is suitably designed in bold-relief hand carving, being surmounted by a typical merino ram's head, exceedingly well executed in high relief, the wool and the eyes showing especially good work and truth of detail. Crossed laurel leaves appear above the names, while on the square columns are carved the leaves, of the eucalyptus. The whole was specially designed, manufactured and carried out by the Goldman Manufacturing Co. of Latrobe street. Stock and Land (Melbourne), 27 June 1917.